This is going with me, until I can learn to not look quite so much at my feet. I’m proud to be part of the Neversink blog tour by Walden Pond Press. You’ve probably heard a little bit about Neversink, say here and here and oh maybe here. Neversink is fantastic and adventurous and full of creatures worth rooting for, all in a setting seldom seen, the Arctic. Wolverton’s vivid characterizations and witty dialogue (oh, Ruby) made me giggle like no middle grade read in a long time. I’ll let you in on a secret. 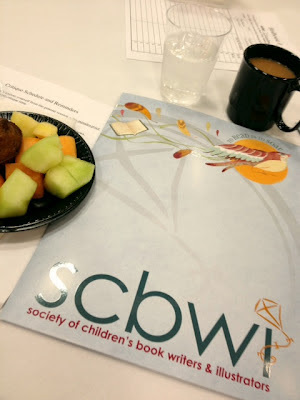 I had a half dozen pages dog-eared to share with you, then I traveled to SCBWI Houston. Maybe it was the buzz from being around other bibliophiles, but I relented and gave my galley to a friend. This means I am unable to share the select dog-eared lines with you as I NO LONGER HAVE MINE. *sob* All the more reason for you to buy your own! And if you leave a comment below stating your favorite arctic animal, I will randomly select one winner by 8:00AM Monday to receive a FREE COPY. What I do have is a delightful exchange between editor Jordan Brown and Neversink’s author Barry Wolverton. 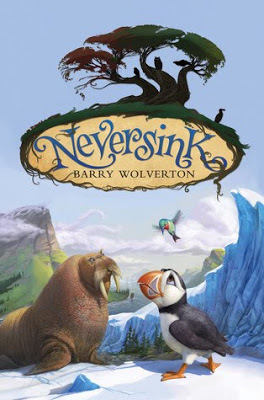 JB: The first thing that grabbed me when I read even the first draft of Neversink is how richly imagined the world is. Was this something that sort of just sprung full-formed into your mind? Or was the process of choosing setting, time period, the myths that populate this world, etc, a long and concerted one? BW: Thank you for that. I love books where setting plays such an important part. I wanted my fantastical story to be grounded in natural science, so I was able to base my settings on real habitats like the coast of Iceland and northern Europe, which have plenty of inherent drama. I also loved the way the beautifully bleak, airy world of Neversink contrasted with the woody domain of the owls. I set it in pre-human times because I wanted this to be the animals’ world entirely (and also so I could take a few liberties with geography). The myths and backstory came after all that other was in place. Obviously in using Norse and Inuit folklore I was going roughly by geography—and it doesn’t hurt that birds and animism are so important to those systems. JB: You don’t see a whole lot of animal stories out there these days. What made you decide to write a book with birds as the main characters? BW: Yeah, what happened to the great talking animal story, Jordan? I had no idea what sort of resistance I was inviting by venturing into this territory. But to answer your question, I was asked years ago, as a junior advertising copywriter, to come up with a mascot with a new brand of marshmallows that was to be called Puffins. The project never went anywhere, but years later when I stood before the auk exhibit at the aquarium in Baltimore, the idea of a puffin protagonist came back to me. And it just seemed to me the puffin was woefully unrepresented in children’s literature. JB: There’s a kind of poetry to having a puffin, a hummingbird, and a walrus as your three main characters. This is one of the things that didn’t require any work during the editorial process—these three complement one another so well that it actually seems natural, even logical. Can you talk a bit about where these characters came from? BW: Well, as you now know, the puffin came from marshmallows (which led to an inside joke in the scene where Lockley is on the Moors). 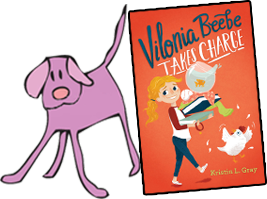 I also wanted my book to have a character who loves books (or stories), since the importance of stories is such a key element. I happen to be a fan of the corpulent critic Harold Bloom, and given my Arctic setting, a walrus seemed to be the perfect embodiment of a larger-than-life, outspoken book lover. Egbert had to have a foil, though, and I love goofy, physical comedy. Picturing a walrus and a hummingbird together just made me laugh, so I bent over backwards to make it plausible for a vagrant hummingbird to be that far north, at least during the summer. JB: There are some really complex ideas about systems of government in the relationship between the auks of Neversink and the owls of Tytonia. That is, the villains and the heroes are drawn more along political lines than traditional lines of good and evil. Was this always a part of your plan for Neversink? How did this element of the book develop? BW: It sort of developed organically. The book all began with this idea of a puffin character. The fact that Atlantic puffins inhabit Iceland and the British Isles fed into my enthusiasm for Norse mythology, sagas, as well as Brit lit and humor. Then you have the fact that the collective noun for owls is a parliament, and puffins are sometimes called a colony, which again fit the setting. That may seem a bit haphazard, but that’s okay. I never intended Neversink to be a satire of a particular form of government, like Animal Farm. Parliamentary government isn’t the villain—it’s Rozbell and his faction. It’s more about the circumstances that can lead to the abuse of power, and how even noble ideals like the desire for self-determination can be dangerous or self-destructive if clung to fanatically. 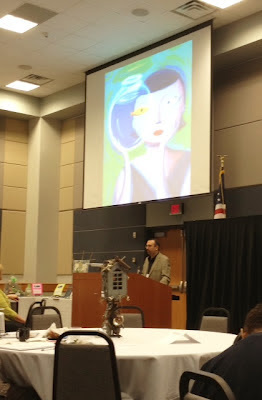 JB: Sam Nielson’s illustrations captured the feel of the characters and the world pretty wonderfully. What was your first reaction to seeing his sketch work? BW: The one thing I feared with Neversink as far as illustrations was the characters being too humanized. You’ll see this style sometimes where the birds’ wings sort of morph into hands or the eyes get a little too big and forward-facing so they can convey more emotion. But Sam’s sketch work showed he was on the same page as me. The landscapes on his blog caught my eyes as well, because the environment is so important in Neversink. The finished art is even better than I had hoped. I love the cover, but I think I love the classical feel of the graphite illustrations inside even more. JB: What was the hardest part of revising Neversink during the editorial process? BW: The ripple effect that even small changes have on the structure. For instance, I wrote somewhere that it was a half-day’s flight from Tytonia to Neversink. One small fact, except that it led to a host of logistical problems when it came to the owls Rozbell and Astra going back and forth between to the two islands. A small thing, in a way, but simply shortening the distance wasn’t an option for many reasons. So I ended up having to create a whole new character in the 11th hour (the burrowing owl, Edmund), to keep the plot working. Oh, and also your deadlines. JB: If you were a bird, what kind of bird would you be? BW: A barn owl. They are quiet, like being up when most other creatures are asleep, and they like barns. 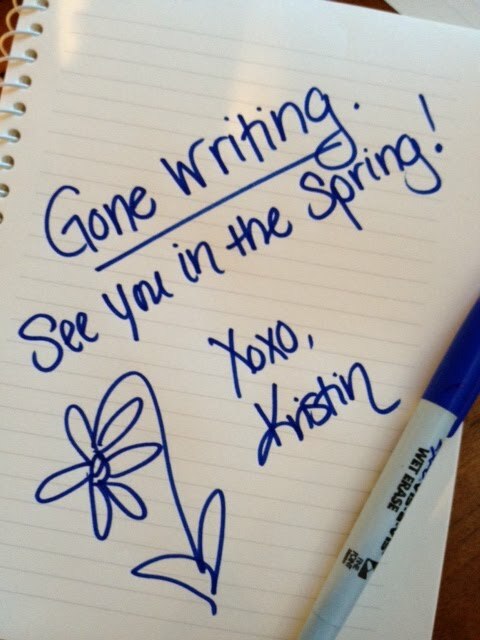 JB: What are you writing next? BW: A girl named Mackenzie Brown who has a pet Hamadryas baboon named Higgins that ghostwrites mystery novels. May you all experience friendships as full as Lockley the Puffin’s. I’m looking forward to hearing who are your favorite arctic animals below! Texans know how to put on a conference. I took a few notes and pictures to share with you. 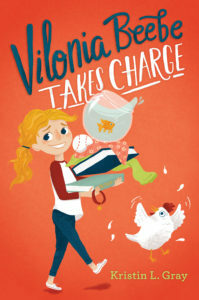 Jen Rofe of Andrea Brown Literary Agency has a soft spot for middle grade stories and “adorkable” characters. (Neversink – which I’m giving away on Friday! – and A Diamond in the Desert are by her clients). She encouraged us to ask “So what?” of our characters and their actions. Why should we care? Does that plot point matter to the story and why? Her power point presentation included examples from literature (Hunger Games) and film (Dirty Dancing). The lift, anyone? Kathleen Ortiz, subrights director with Nancy Coffey Literary, covered author websites and whether or not you need one. She recommended acquiring a domain name in YourName.com, saying if you do nothing else pre-published, at least secure your name. I had to slip out for the majority of her talk for my manuscript critique with freelance editor Sarah Cloots. Jenne Abramowitz, editor with Scholastic (trade paperback Ghost Buddy etc. 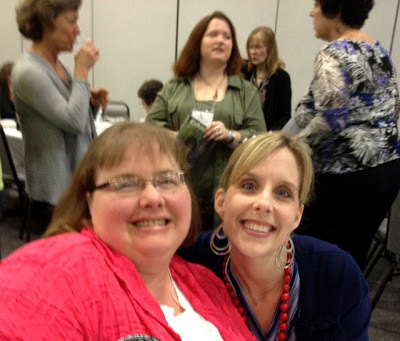 ), wowed us all with her presentation on chapter books. She said if you want to write for this audience, be prepared to produce a manuscript every 3-6 months and keep the plot linear. Children in this age range (7-10 years) have moved on from easy readers and are discovering fiction. We don’t want to confuse them with complicated subplots and flashbacks. 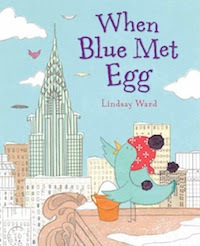 Connie Hsu of Little Brown Books for Young Readers enjoys editing hilarious or dark humored picture books or middle grade novels, and young adult books that lend themselves to illustration. She focuses on acquiring novelty projects, such as the very cool Kaleidoscope. Ms. Hsu, energetic and fun, gave us a fantastic talk on diversity in literature. Here’s a picture of me and Mandy taken at the end of the (long) day. Behind us is author Lynne Kelly, whose debut novel Chained releases May 8th, a story of a Indian boy who befriends an elephant. I, for one, cannot wait. And I’m still regretting my choice of dangling earrings below. Happy Wednesday and lots of Xoxo. I’m trusting YOU all to behave, eat your vegetables, and fill me in on the latest when I return. 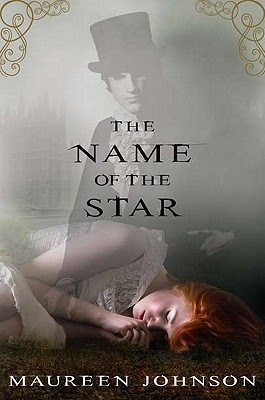 Last night, I began THE NAME OF THE STAR by Maureen Johnson. At dear son’s basketball practice no less. (Thanks, Mandy.) I’m only on page 82, but I may have made a few clicks online to see about enrolling in a study abroad program in England next semester. They allow children, correct? They’ll be good and quiet. No trouble at all . . . *wink*. I finished Erin Morgenstern’s debut, THE NIGHT CIRCUS, at one o’clock yesterday morning. I enjoyed the story and its present tense. I loved being swept up in the circus–the sights, the sounds, the caramel scents. The curious magic and many mysteries surrounding her characters kept me turning pages. 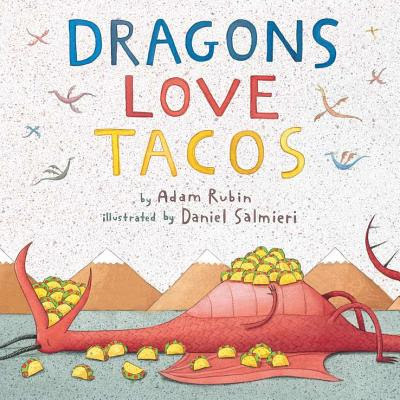 The author is a brilliant wordsmith and has a great imagination. That said, I wanted to love it more than I did. Honestly, I was a tad confused by the end (it was late). Regardless, I’m still amazed by her skill of weaving so many fantastical threads together, from differing points of view. I loved Bailey’s character best. Worth a read. 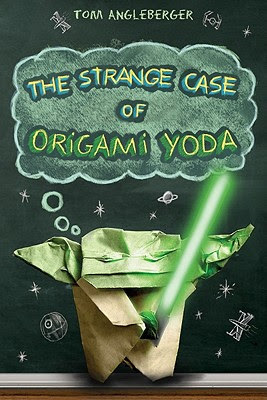 And THE STRANGE CASE OF ORIGAMI YODA is my car line read this week. I’m a bit behind on this because I have three elementary aged boys under my roof and we arm-wrestled for it we did. A witty and fun read, a compilation of several short stories make it an easy one to turn to when you only have a few moments at a time. Like me, right now.